Over the course of the development of this site, I have come on and linked to many other sites containing interesting and related information. Sometimes in checking links, I find that those sites have disappeared. Often I keep local copies of all or parts of interesting sites. In an effort to preserve useful information I have reconstructed site information below. If I have reproduced this inappropriately or inaccurately and you are its original author, please contact me and I will remove or correct it. I make no claim that I have rendered pages exactly in their former state, but have tried to preserve their general appearance. The site presented somewhat different set of images and different text from the classiccamera site and so, even with some duplication, I think it is worth reproducing. This information was saved in PDF format, so I am not sure exactly what its HTML pagination was originally. In the late 1940's, there was a general consensus in the professional photographic world that 70 or 80mm film (formerly used in allied and axis aerial cameras) would be one of the waves of the future. This would provide the quality of medium format with the convenience, mechanical advantages, and low cost of 35mm film. The Graphic 70 was designed by Hubert Nerwin, prewar design chief at Zeiss Ikon, who came to work for Kodak in 1949. 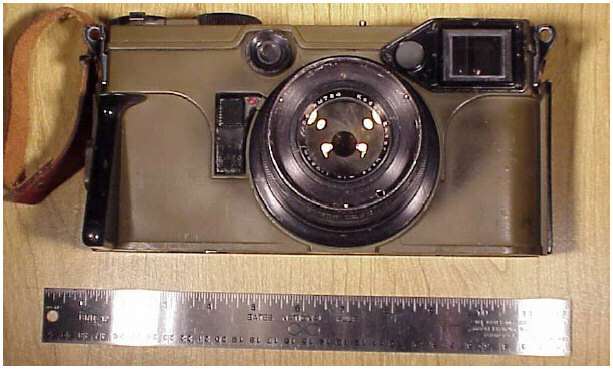 It was a larger version of a focal-plane shutter 35mm camera with bayonet-mounted lenses and a viewfinder keyed by the lens mount, as in the later Leica M2 and M3. Lenses provided included a 100mm Kodak Ektar (f/2.8), a 205mm Kodak Ektar (f/4.0) and a 65mm wide angle lens. The Graphic 70 was officially available in both civilian (special order) and military versions, although there appears to be no record of production of a civilian version. 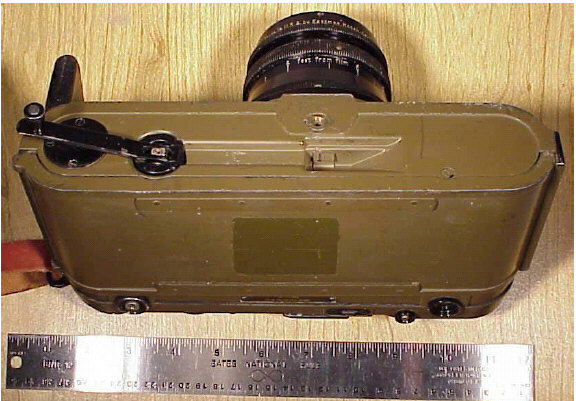 The military version was identified as the KE-4 camera, or the KE-6 camera system. 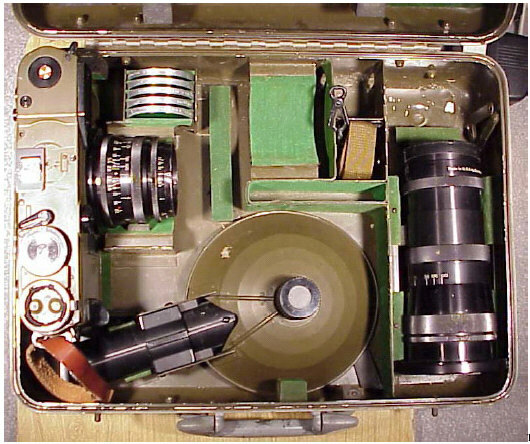 Confusingly, the KS-4A camera system from the same period was a military version of the Pacemaker Speed Graphics. Designed to meet military specifications, the fabulous Graphic 70 offers unusually fine optical performace and so many features that only a few of them can be touched upon here. 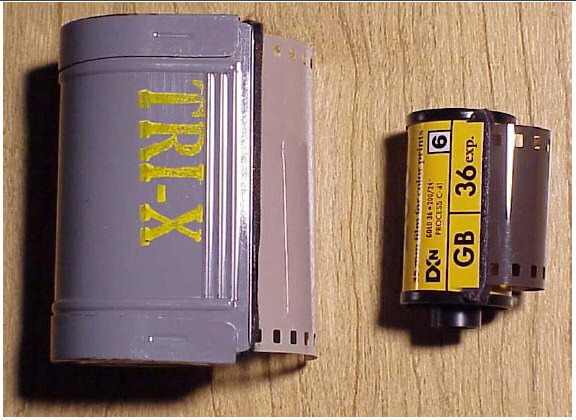 For instance, pressing the release button not only releases the shutter, but in addition causes the advance of the film and rewinding of the variable-slit self-capping focal place shutter. One winding of the self-contained motor will allow making 10 full cycles. Other features include a cut-off knife, so that andy part of the 15 foot length of film (making 50 exposures) can be run into the cassette on the takeup side for immediate processing. The frame number of each complete exposure is recorded not in the frame area, but immediately adjacent to it, and the counter returns to zero when the back is opened. 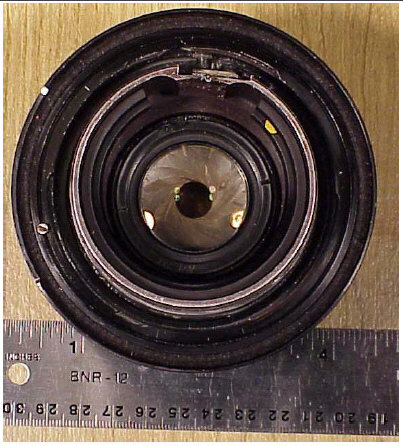 Provision is made for bulb and electronic flash; the bulb flash unit bayonets directly onto the camera with no wires. The three lenses -- standard 4-inch f/2.8, telephoto 8-inch f/4.0, and wide-angle 2 1/2 inch f/4.5 -- have excellent resolving power over the entire field and are fitted into special focusing mounts bayoneting into the front of the camera. 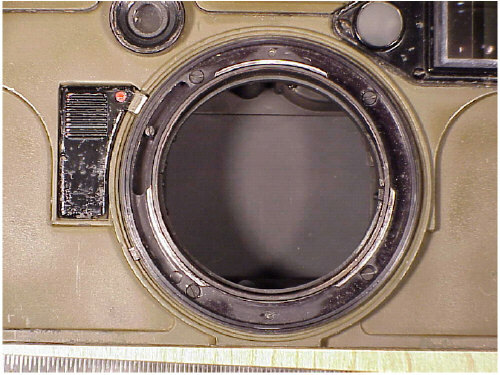 Interchanging the lenses automatically adjusts the rangefinder for focus and changes the magnification in the combined range and viewfinder window. Focusing closer also automatically shifts the parallax frame and reduces the image area to indicate exactly the area included by the lens at any given working distance. These are but a few of the advanced features of this outstanding special-order camera. Graphics 70 systems are not very common; they seem to show up on Ebay about half a dozen times a year. I have seen them offered by Shutterbug advertisers only twice in the last five years. Most of them are missing the wide-angle lens, and most of them seem to have shutter problems. Ken at Photography on bald Mountain who repairs them informs me that many have been canabalized for parts to keep others going. The going rate on Ebay seems to be about $500; repair of a shutter (if possible) is about $500. The KE-6 system includes the body, the three lenses, a bulb flash, wrist and shoulder straps, a set of series-8 filters, presumably a lenshood and filter adapter (mine is missing these) and an Aluminum Halburton case for the set. The body is made of titanium, and is painted olive green. From the front it looks like a conventional 35mm rangefinder camera, except about twice the size. Without a lens it weighs 60 oz (1.7 kg); with the standard lens it weighs 82 oz (2.3 kg) with strap lugs it is 10 1/4 inches wide (26cm), 5 1/8 inches high (13cm) and 2 1/2 inches deep (6.2 cm) although the right-hand grip extends this to 3 1/2 inches (9 cm); the standard lens extends an additional 2 1/2 inches (10 cm). 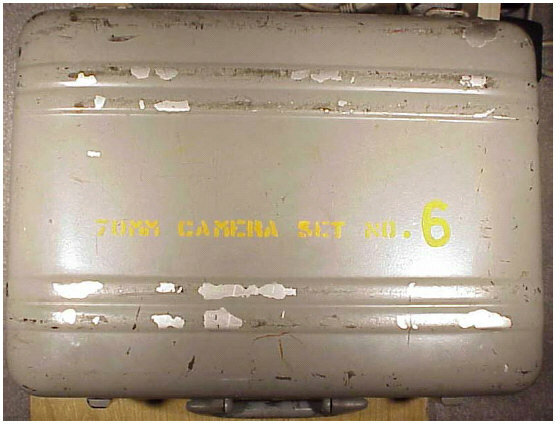 70mm film never achieved the success forecast; it became and remained popular for school portraits and for aerial photography. The school portrait popularity is based on the fact that it is large enough for contact prints, and that in long rolls a photographer could take pictures of an entire school without reloading. The aerial market popularity is based on the ability to shoot a large number of images in an electric camera without reloading, and on the tradeoff between resolution and cost; with modern emulsions and cameras it does as well as 5 or 7 inch film used to at a fraction of the cost. 70mm film availability has decreased over the last two years; Ilford and Agfa appear to have dropped it entirely, and Kodak has dropped all emulsions except VPS and a limited number of aerial films (most usefully Plus-X and high-speed infrared). Presumably reflecting the decline in the school portrait market, B&H dropped 70mm film from their catalog at the beginning of 2001, although it is still available though their web site (primarily in the aerial film section).